Last night I spent the evening with my husband and 2 extremely good friends. They had us over at their place for a summer BBQ and a catch up before we fly to Mexico next week. It was a really great evening and the first time we have seen them since my birthday. Despite being built like a wrestler he has an unexpected passion for baking and despite some mocking from his friends he takes every opportunity to experiment in the kitchen. We often have theme evenings where he and I take turns to cook a meal for the four of us themed on the culinary styling’s of a particular Country so far we have covered Italian, Spanish, Mexican and even a British 70’s diner party inspired evening. What makes Lawson’s baking so special is his efforts to personalise his meals to suit the people he is cooking/baking for. For example he made my husband a Red Bull cake for his birthday! 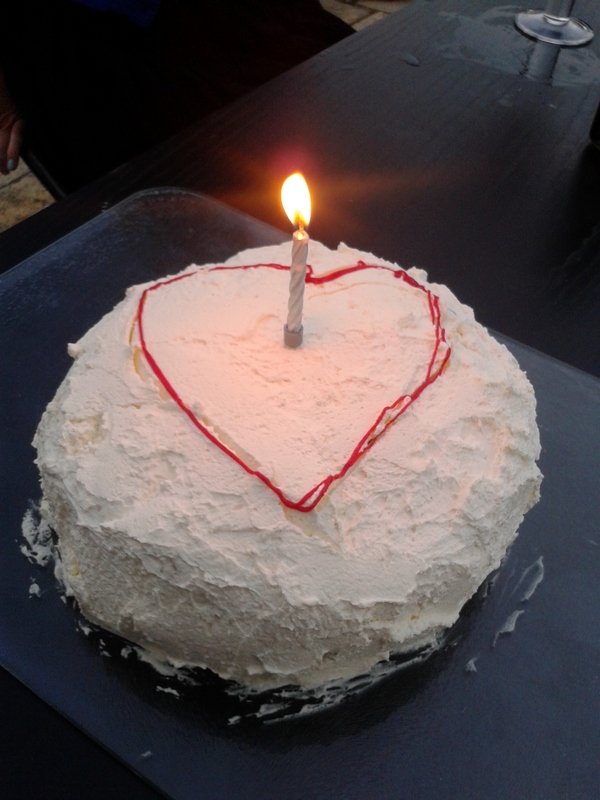 When he brought out my cake last night his girlfriend and my husband both seemed a little put out at the seemingly romantic gesture of placing a red heart on the icing in red syrup. This was until I squealed with excitement, remembering a trip the four of us took to Tunisia at Easter. Every day when they all enjoyed a beer mid afternoon in the hotel lobby I had a coffee. 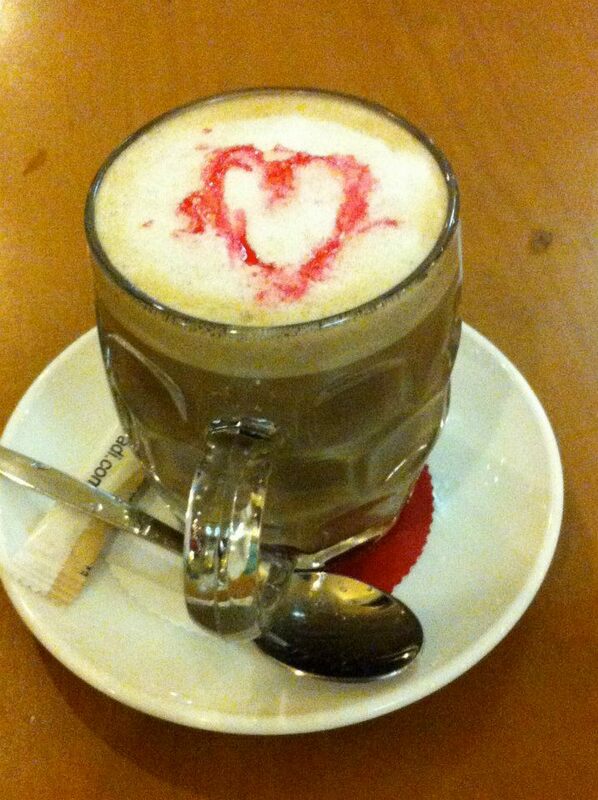 The barman made me what he lovingly referred to as his “Special Ali-Baba Coffee”, served in a beer glass with loads of frothy milk and a heart drawn in the foam in red syrup. The cake was a coffee cake and absolutely delicious. The Olympic Games 2012 have inspired the British public with a renewed interest in competitive sport. I am not a sport enthusiast but I love the sense of National pride, passion and patriotism and the buzz surrounding the Olympics. As a dramatist the Opening Ceremony is the main highlight rather than the sporting events. After the spectacle in Beijing 4 years ago I fully expected to be hugely embarrassed by our efforts with red buses as far as the eye could see and David Beckham lobbing a flaming football in order to light the Olympic flame. However I watched the ceremony in awe at what was described by the Guardian as an “eccentric British history lesson”. It was clunky and a little disjointed for my personal tastes but uniquely British. 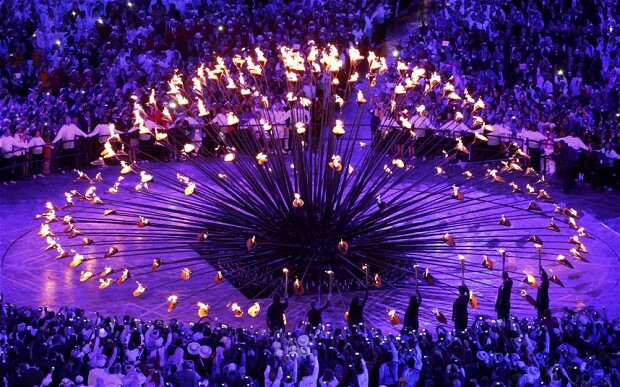 My favourite moment was the lighting of the cauldron, a spectacular design of 204 copper petals bursting with flames representing the countries participating in the games being joined together 28 feet in the air – a fantastic symbol of the coming together of nations. Today is day 14 and the medal count for team GB stands at 52; 14 Bronze, 13 silver and 25 coveted Gold medals. From what I understand this has exceeded expectations and smashed the targets that were set. I look forward to watching the closing ceremony and if I am honest to the end of the London Olympics. It has been a fantastic showcase of British talent, creativity and tenacity. But despite this, there are two aspects of the Games that have truly irritated me. Leading up to 2012 – The Games last for 16 days but for the host country there are also at least 2 years of hype. Articles about every aspect of the planning stages appear in every newspaper, magazine and news program. As a teacher I have had the Olympics forced on me for two solid years I have been forced to artificially incorporate Olympics related activities into my lessons and instil the values of the games in my students. It is an important National event and as such it should be used as a teaching aid but with every mention of the Olympics it’s as if a light goes out – the kids were bored with it long before the opening ceremony and didn’t want it in forced on them in such an unrelenting way. The second thing that bothers me is the legacy of the London Olympics. The physical legacy of the transformation of East London and the Olympic Park has brought new life to a neglected part of our city and provided an excellent venue for future athletes training. The Olympic Village will provide new homes for sale and rent, thousands of jobs have been created and there has been a very welcome boost to the economy. I am less enthused by the prospective legacy for our schools. This morning I was horrified to read that Boris Johnson is pushing for children to be subjected to 2 hours of compulsory PE every day. He claims that this would be wonderful for kids across this country. For some children this is true. Sport has a massive place in our schools and like the Olympics is offers a great opportunity to bring the school community together to celebrate talent and achievement. But not all children are naturally sporty and sport should not be forced on children to the detriment of their self esteem or achievement in other areas. I am not suggesting that education is exclusively about academia, it should be about the development of the whole child including the promotion of a healthy and active lifestyle. The key is to provide opportunities for students to experience a wide variety of subject areas and discover their individual talents. The reality is that devoting more time to sport means giving up time in other subject areas. Schools also have a role in raising standards of literacy and numeracy, there is no point in having a nation of talented athletes if future generations are unable to read and write. It is important to take inspiration from the London Olympics and look at ways of enabling future athletes to achieve the same level of success whether that’s training, funding or providing venues. But if everyone had the same ability in the sporting field it wouldn’t be called a talent. Perhaps the best legacy of the Olympics would be if we would all take time to recognise talent, creativity, determination, commitment and inspiration in whatever form these values take and allow people to chose for themselves how much or how little they want to get involved. For as long as I can remember I have wanted to buy my own house. It is something of an obsession but given the difficulty of getting onto the property ladder, due in part to the lack of affordable property and the huge deposits required by lenders; it is a soul destroying process. Owning my own home is not just an abstract idea but something I have actively pursued. I have taken many steps over the years to put myself in a position to buy but I never feel any closer to achieving this important goal. I have given this a great deal of thought, why does it matter so much to me that I own my home rather than renting? My husband claims that it is society telling me it’s what I should want but I think it goes deeper for me. I have been renting the same place with my husband for over eight and a half years now. Could we settle for this permanently? NO, NO, NO!!! I WANT MY OWN HOUSE I AM NOT WILLING TO COMPROMISE!!! DEPOSIT– When we first moved in we had to pay a deposit of one and a half months rent plus our first month up front. I have no doubt that we will never see this money again. I am yet to meet anyone who has received their deposit back when they move out of rented accommodation. I am not suggesting that a landlord should be held responsible for paying for any actual damage to the property by the tenants; just that the money grabbing gits ignore the reality of natural wear and tear and find pitiful excuses to keep hold of this money. CONTRACT RENEWALS – Each year we receive a bill for renewing our contract. The only change is the dates and this apparently incurs a £50 charge. They cannot seriously expect me to believe that the administration required to do this is worth that much, it is simply another unnecessary and money grabbing ploy. REFERENCES & NOTICE PERIODS – Last year we did apply for a home but were required to provide a reference from our landlord. We were charged a fee for them to do this and informed that should our application be successful we would be expected to give 3 months notice before we could move out. MAINTAINCE – It is the responsibility of our landlord to pay for any improvements to the property itself. The problem is he doesn’t care. 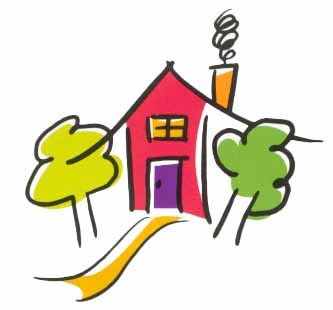 We do not deal directly with the landlord but through a letting agency and we are totally at their mercy when things go wrong. We have had a serious leak in our living room roof for the last 7 years, this has been “fixed” on multiple occasions but every time we have heavy rain the incessant dripping starts again. We have never had adequate hot water pressure so filling a basin or bath takes a ridiculous amount of time. We are unable to use the shower because the water cabinet is higher than the shower head and the system is gravity driven. The landlord is aware of these issues but evidently feels no urgent desire to address them. I wonder if he would put up with these things in his own home. PERSONAL TOUCHES – I am currently stuck with magnolia walls and rust coloured carpets in every room of my home. These are not my choices but my accessories, furniture etc must tone in with these. As it is an unfurnished place it means I must consider these dull colour choices for every major purchase. We held off on buying a new sofa for years despite the fact that our old one was knackered. I recently we gave in but was restricted in my choice due to the colours in the flat that I cannot change. As part of my contract I am also unable to hang pictures on my walls. It is these personal touches that turn a house into a home. GARDEN – I want a garden. Our flat is on a second floor and the heat rises. There is no real ventilation so over the summer months it is extremely hot and stuffy. Being cooped up inside is very uncomfortable and makes my husband and I dread the warm weather that most of the nation craves. I could of course rent somewhere with a garden but at this point I would need another deposit, the monthly rent would be higher and it would take even longer to buy a house. I do realise that should I buy my own place I may have to work my way up starting with a flat again and building towards a house with a garden when we are firmly established on the property ladder but a garden is definitely on the long term wish list. FAMILY – As my husband and I are both in our early 30’s we have talked about having a family one day and our flat is entirely unsuitable. There are two families with children in our building and watching the drama of getting prams and baby accessories up and down the narrow stairs is enough to put anyone off. The families in question make do as best they can but cannot afford to move so are trapped with the situation. MONEY – The reality is we should be able to afford to pay off a mortgage. We both have good stable jobs and we have been paying extortionate rent since our early 20’s. Putting the deposit aside for one moment the only question banks should be asking prospective house buyers is how much they have been forking out over the time they have been renting. That is probably a better indication of their ability to meet payments than any credit score. Depending on the property you rent/own the monthly cost can be very similar. The property I would like to buy would cost us more each month but it is a new build. I would happily pay more to escape the leaking roof. RETIREMENT – One day I hope to retire. I have a good pension and would like to spend it going on cruises and spending time with my extended family which will hopefully involve children and grandchildren by then. Ideally I would have paid off my mortgage by then so I can use my pension for other things. If I rent forever then the monthly bills won’t stop just because I stop work. The reality is that no matter how much money you throw t rented accommodation it will never be paid off. The average age for people buying their first home has risen to 38. I would like to beat those odds and get my own home sooner so I can at least think about having children. I have decided that my efforts towards achieving this goal will be a regular feature on my blog with updates on my progress and hopefully images of my first set of door keys when we finally buy our own place. Like many British couples my husband and I go abroad every summer. Much to my parent’s frustration, we are not particularly keen on Europe. Don’t get me wrong, I was lucky enough to enjoy many family holidays there as a child and I loved every second of them. But nowadays my husband and I prefer to go a little further afield and my parents don’t like it one bit. My Father in particular is very protective and somewhat nervous about my travelling. I fractured my skull on holiday as a child, so we have firsthand experience of the complications of sustaining a serious injury whilst abroad and the benefits of having good travel insurance. On a trip my Dad took to Tunisia he made the mistake of visiting his GP before his trip. This raised the issue of the vaccinations needed to protect him against tropical illnesses. In addition he was also directed to a travel website which warned about respecting local culture, being aware of ongoing political controversy and ensuring that women “cover up” to avoid offending people. Holidays are designed to relieve stress but this one seemed to be generating it instead. Once he was actually in Tunisia, Dad found the aggressive sales tactics used in the markets hard to deal with and extremely intimidating. As many of our wish list holiday destinations are in countries experiencing political turmoil such as Israel, Dad has come to dread the conversation each year when I tell him where we will be going. The desire to visit more exotic locations may stem back to the first holiday my husband and I took together. This was to “parent approved” Ibiza and it was disaster. As a couple we were perhaps not the intended target market for the 18-30’s meat market that the travel agent recommended for us. In addition to this we had not really brought enough money with us and funds evaporated pretty quickly and as we had only paid bed and breakfast up front it was difficult stretching our meagre funds to last the two weeks. This made it a miserable experience and being surrounded by permanently drunk and hormonal students out on the pull, may have tainted our view of the destination unfairly. The following year we went for something completely different. We booked an all inclusive holiday in Morocco. My Father was very unhappy. To be fair to him we still weren’t seasoned travellers and it was a country that is culturally very different to our own. It was also during troubled times and our trip was less than a fortnight after September 11th making it a nerve-wracking time to fly. But it was without doubt an amazing experience and we came home desperate to visit similar destinations. Two years ago we had planned to go to Tunisia with friends over Easter but the riots to remove President Zine El Abidine Ben Ali and the state of emergency that followed was a step too far for my parents and I could tell from the impassioned plea over the phone that the request for us to chose an alternative destination was non-negotiable, so we decided last minute to go to Majorca instead. Luckily the company of our good friends made our stay at a hotel that was locally nicknamed Hotel Beirut during peak season more palatable. In Jan 2011 we booked our summer vacation. We had actually earmarked our destination two years earlier, it was simply beautiful, an adult only hotel in paradise, but it was extremely expensive for us so we had to wait and save up. When I told my parents we were going to CUBA the silence over the phone was deafening. If you were going to design paradise it would look like the Melia Cayo Santa Maria. A stunning resort and one of the best holidays I have ever had. We did however go during hurricane season and as we watched the news channel each morning of our stay, it was with great amusement that we witnessed startling images of a tropical cyclone start to build on August 20th 2011 and it was heading straight for us. The days were still blisteringly hot but in the evening the sky lit up with spectacular displays of forked lightning dancing across the sky and rain flooded the resort grounds. Our amusement was largely due to the fact that this force of nature had been given the same name as my Mother. It seems that my parents were so deeply disgruntled by our choice of holiday destination that Hurricane Irene had been unleashed and sent after us. This year we are off to Mexico – and when I checked my Facebook Status this morning there was a message from a family member who lives in the states asking if we were still going and warning that a Hurricane has started to build. Yes. We are still going and no doubt Hurricane Frank will be there to greet us! It’s that wonderful time of year again. School is out for the summer. It still feels strange being able to fully appreciate school holidays again having returned to school more than 10 years after I first left. I am certain that when I walked through the school gates for the last time after my A-Levels that I swore to every major deity that I would never return. However time is a great healer, so four years ago I returned to university to retrain as a secondary teacher of Drama. It was a really tough experience but teaching is not without its rewards, I am of course speaking of the 6 wonderful weeks off during the summer months and I am trying to make the most of this time – but it’s hard. It is tempting to spend the entire holiday doing housework and planning for the upcoming school year, especially as most professions do not come with this perk so none of my non school friends are off work and my husband is still busy, busy, busy, Monday – Friday 9am-5pm. I know what you are thinking have some quality time on his days off but he is fiercely protective of his days off and rather keen on spending them in front of the computer playing WOW. We will get some of the summer together as we will be going to Mexico at the end of the school holidays. It’s odd, on holiday we love being out in the sun by the pool or on the beach but we are woeful at enjoying time out during the rare spells of good weather in this country. We don’t have a garden so end up cooped up in our flat boiling hot and miserable. 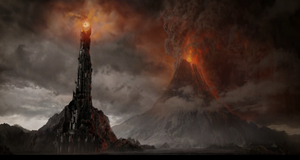 On a recent and wonderfully sunny day off I attempted to convince my husband to actually leave the house, a suggestion treated with the same fear and contempt last seen when Frodo asked his mates to join him on a trip to Mordor. 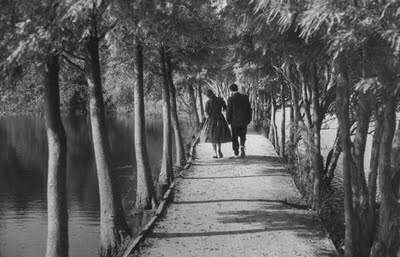 I suggested a romantic walk at The Look Out in Bracknell followed by a visit to a local pub by a lake for drink and maybe a snack. Half way round the forest trail he called work from his mobile. Now technology is a great thing and it has enabled us to be instantly available 24/7. However surely there are certain occasions when we should not allow ourselves be so accessible to the rest of the world? Challenge yourself this summer. At least once, on the next nice day that you have time off, take your partner or family out, leave the mobile behind, switch everything off, don’t worry about “checking in” and updating you status on Facebook, don’t answer any calls from work and simply enjoy a few hours together in the sunshine. When I left school I knew exactly what I wanted out of life. I was going to be an actress. I left my home town of Carrickfergus in August 1998 and moved to Surrey where I enrolled on a three year Theatre Studies degree course at one of Britain’s best Drama Schools. When I graduated, I worked on a temporary basis through a number of agencies for various organisations. This gave me the flexibility to earn a living but also to take on professional acting roles including; TIE, short films, commercials and music videos without the hassle of having to work long notice periods or be tied down to a job indefinitely. Unfortunately when it comes to knowing what one wants out of life – life (and what we want out of it) changes over time. Over the years, I developed different tastes: I discovered that I liked clubbing, I met the man who would eventually become my husband, and I realised that at some point I wanted to own my own house and maybe even have children. I realised that to meet my revised life goals I would need greater stability to be able to do more mundane things in life – like pay rent and bills. I started to take on more “permanent” jobs that were less suited to a nomadic lifestyle and as such demanded more commitment to sticking around and being “professionally developed”. I HATE the term “PROFESSIONAL DEVELOPMENT” but I will no doubt revisit that in the future. The point is that after a series of “permanent” but ultimately unsatisfying jobs I was eager for something that challenged me. On one of my acting tours a colleague talked to me about a Saturday job she had at Stagecoach Theatre Arts. I had watched her run a workshop after one of our performances and she explained afterwards that her confidence and repertoire of Drama activities came from her experience as a Stagecoach Drama teacher. She was an accomplished workshop leader but saying that, nothing she had done was earth shattering. During my childhood I had attended Drama clubs from the age of 11 and at one point I was attending 3 different groups every Saturday and walked the length of Belfast from one to another. I considered whether I had the ability to pass on my own subject knowledge to enquiring young minds. I knew had I the passion to do it but was less confident about controlling a group of young children. However as I was often disappearing for Acting Tours, it was a flexible way of working and it would bring some stability to my working life. As the hourly rate at the time was about £17 per hour I definitely thought it was worth a phone call or email to head office. I contacted Stagecoach as soon as the tour finished and I returned to my mundane job as a hotel receptionist. They immediately put me in touch with my local Stagecoach which was only 2minutes walk from my front door. This is when I first met the principal Pete Gee (mentioned in an earlier post) who has become a dear friend over the years. He took me on as a deputy covering staff absence in all three disciplines; Drama, Dance and Singing. Over the years i have taught all three disciplines but have now been the Drama teacher for about 5 years. What started out as a well paid part time job fast became a passion and I have now been with the company for 8 years. Working with children is a privilege and an education of its own, not something for the feint hearted but definitely something I would highly recommend.